I have been told recently that I need to amp my iron intake and my mother so wonderfully bought us two gorgeous rib eye steaks. Grass fed AND organic. Delightful. Problem? I’ve made steak only a handful of times in my life, and all of those times I bought crappy steak that I completely over cooked. So I was nervous at the prospect of cooking these two beautiful steaks and well, messing them up. 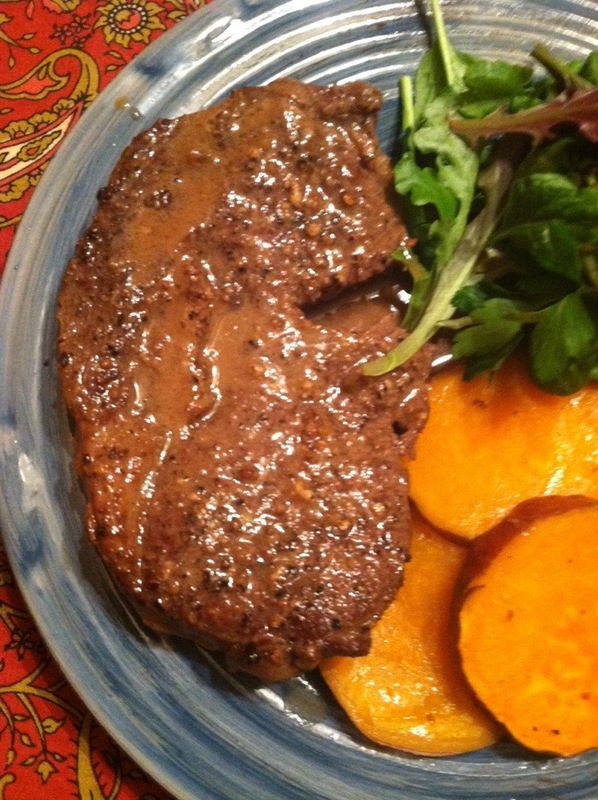 So I did what anyone of my generation would do; I googled: Novice steak cooker, simple recipe. Tons, I mean TONS of grilled steak recipes came up. Salt, pepper, grill, boom you’re done. But it was like 9 F and we have retired our grill for the season. So I kept looking. and stumbled upon this gem that was actually not a recipe as much as a menu from a Parisian restaurant. ( Okay I get distracted easily). Their staple? Peppercorn sauce. Flashback to when we crazily took our three month old on a day trip to Paris who then was almost deported without her parents for visa problems…we ate lunch at this delightful bistro in the Latin quarter and had…au poivre sauce…I HAD to make it. 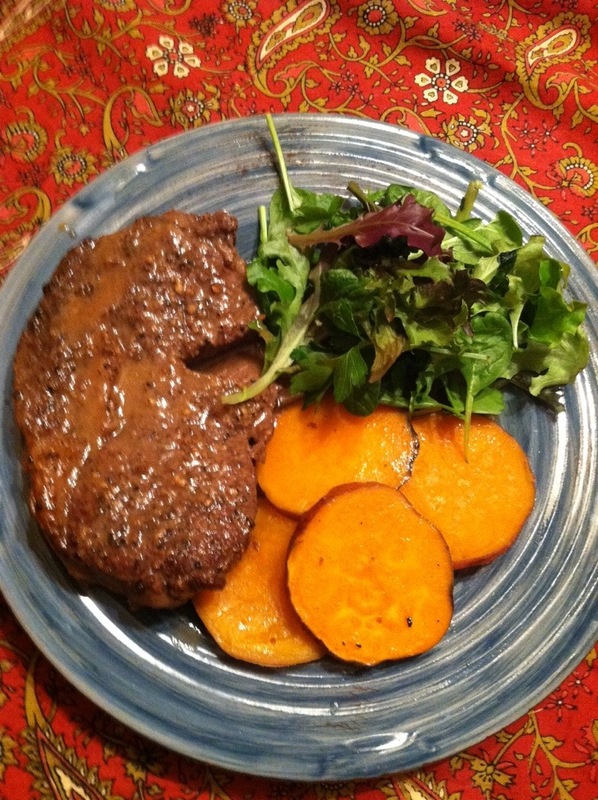 Turns out, it’s not that hard and….this was the BEST steak recipe I’ve ever had. Ever. Coat the steak with the pepper on both sides, then do the same with the salt. Heat the oil in a sauté pan on medium high heat, add 1 tbsp butter and when butter is foaming (but not browned) turn heat down to medium and add steaks. Cook 5 minutes on each side and 2 minutes on sides, covering with juices as you go. Remove steaks and place on reserved plate. Tent with aluminum foil. Add wine and scrape up all of the brown bits. Add chicken stock and balsamic. Boil for 2 minutes and reduce heat to low. Dice butter while sauce is boiling. Add butter bit by bit, stirring to incorporate evenly. Add cream and mustard and stir. Add steaks back in and cook for further 30 seconds to one minute. Taste and salt and pepper to your preference. I served with honey roasted sweet potatoes and salad. It was absolutely fantastic!